The life of an amateur/hobbyist woodworker is fraught with perils that conspire to steal the precious little time that can be devoted to woodworking and furniture building. If you happen to be married than the risk to that time is exponentially increased. The dreaded “honey do” is always lurking just around the corner. Almost always posed in the guise of a request, but the seasoned among us know better. It is just such a “request” that has been taking up all of my shop time as of late. The house that we purchased and moved into over this past summer was built in 1968 and designed by the original and sole owner. As such, it remained virtually unchanged over the years. There is no master bath and the bathroom and kitchen are essentially time capsules. Lovingly maintained over the years, the house aged in almost pristine condition. These “outdated” features however are what kept the house from selling. Most folks looked at it and saw total gut jobs and tens of thousands of dollars in expense. My wife and I fell in love with the details and those “dated” aspects are what drew us to this house. All of the cabinetry in the house was built in place. No mass-produced boxes installed anywhere. The bathroom vanity and the kitchen cabinets were all built in place piece by piece. They are nothing fancy, but solid beyond belief and have stood the test of time. The above is a photo of the kitchen as it looked on the day that we viewed the house for the first time. Notice anything missing? I didn’t at first, but the wife was quick to point out the lack of a dishwasher. I told her to go and stand by the sink and I would take the picture again and solve the problem. She failed to see the humor however, and my fate was sealed. “Honey do” mission number one would be to install a dishwasher. So after a couple of months pondering and putting off the inevitable the time came to tackle the dishwasher install. The electrical and plumbing were not that big of a challenge, I can do that stuff in my sleep. No, the big issue was the built-in cabinetry. If the kitchen had standard cabinet boxes, I could have just taken one out and slid in the dishwasher. These cabinets are a continuous mass running from the wall. Cutting into them was a little daunting. 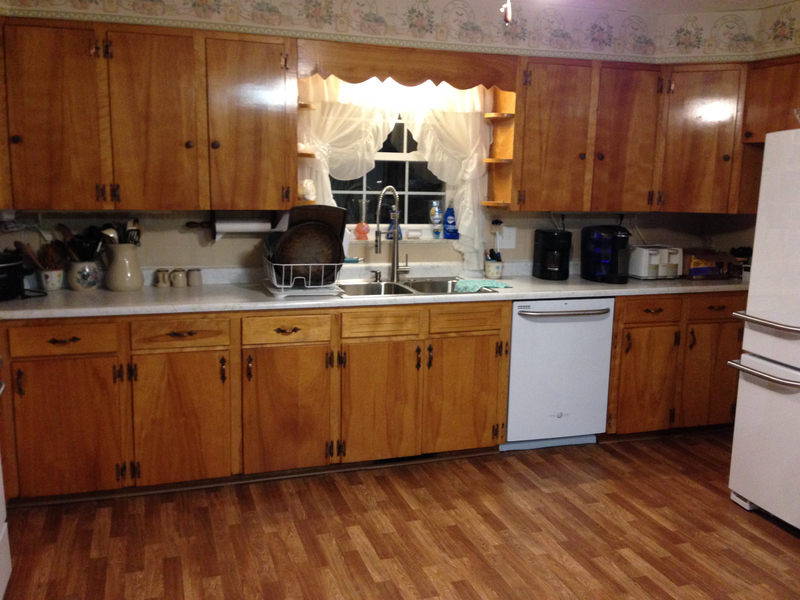 To make matters more complicated, the cabinets are 30″ “blocks”. In other words, two drawers with two doors below are about 30″ wide. A standard dishwasher is only 24″ wide. What to do with the extra 6″ puzzled me for a while. The epiphany came Saturday morning. Since the front on the cabinets is just one large face frame, I could cut out a section and mover everything over 6″, frame, doors and drawers. Then install a filler board where the cabinets meet the wall on the far right. I’ll spare you the blow-by-blow, but after not one, not two, but three trips to Lowes for parts and supplies I managed to install, with the help of my brother, a new sink, faucet and dishwasher. Leaving me in good graces for at least a little while. 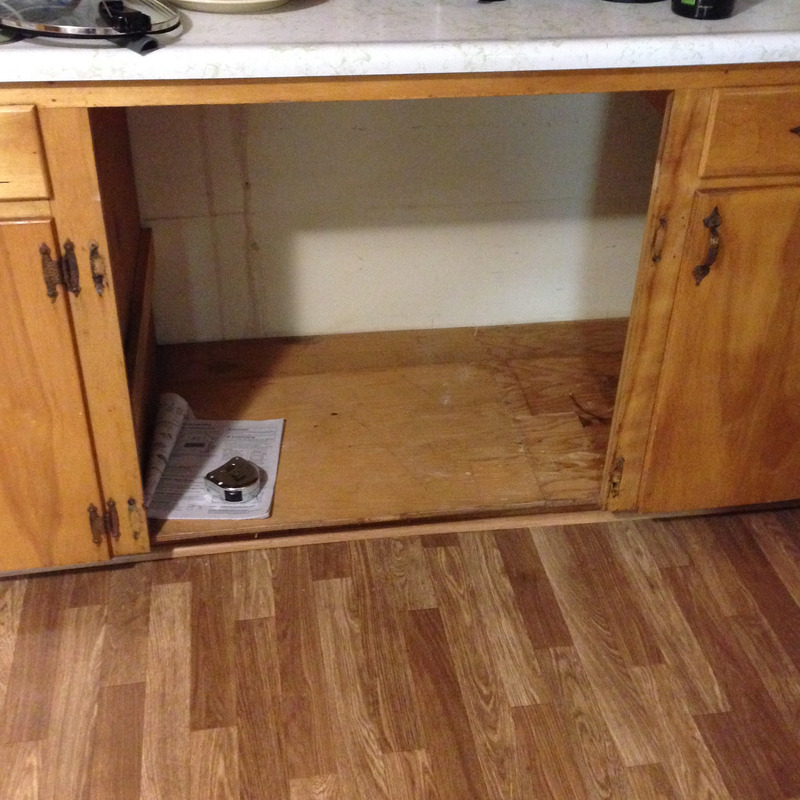 This entry was posted in Dishwasher Install and tagged built-in, cabinet, honey do. Bookmark the permalink. The best part of this story ” I told her to go and stand by the sink and I would take the picture again and solve the problem. ” Why do women need such a tool, they stand at the sink rinsing & scrubbing the plates anyway before throwing them into the dishwasher. I fail to see how they are saving time since their doing half the job preparing it for the dishwasher. The kitchen looks massive compared to our standard sized models. We live on the world’s largest island with the world’s smallest houses. Ha, don’t get me started as to the actual need for a dishwasher Salko. It makes the wife happy, thus it is worth the effort. Yep, the kitchen and adjoining dinning room are one very large room. The largest room in the house, 16’x24′. It feels absolutly huge to us too. We spent the last 19 years in a house that was just over 900 square feet. We secured a fantastic deal on this house and jumped on the opportunity. As I would too you know the old saying it was meant to be. Can you give us a tour. What about the workshop the most important part of the house. LOL…don’t get me wrong, I share in the domestic chores. Washing dishes, laundry, dusting and all of that. It has been a little lopsided since the move. My time has been spent on restoration, remodeling and maintenance. It looks awesome, and I love the humor thrown in there! You are a brave man Greg. A comment like that would have put me in the dog house at best. BTW how do you like your new workbench? I would love to get your insights on the comparison to your Paul Sellers inspired bench. I’m vacillating between those same two options when I’m ready to upgrade. I like the new bench so far, but have only ran one project across it. I need to work with it a little more to really be able to make any comparisons. We only got a dishwasher because my boyfriend insisted, and now I’m grateful, and we’re strict about rinsing beforehand because food has no place inside the workings of a dishwasher. I’m the one doing the dishes but only because he cooks nearly every time. Tone is important, but I certainly could have been hurt by such a comment from a loved one. Thanks. All was said in fun. No malice in tone or intent. And I wanted to add, I’m very glad you kept the original kitchen, which is awesome, it’s so sad when people gut this sort of thing. We are all about trying to keep as many of the original details as possible. It is clear that the original owners loved this house and it is reflected in the condition. good solution for an, let’s say, interesting problem. As you mentioned, never thought about something like that, because of having a kitchen with standard cabinets. Thanks Stefan. It was a different problem for sure, but I’m (she) is happy with the end result. That was the first solution discussed. But once I realized I could shift the remaining drawers and doors to the left, that original idea went to the wayside. Shifting everything 6″ dramatically increased the accessibility to the remaining cabinets due to the proximity of the fridge. 6″ doesn’t seem like all that much, but it did make quite a difference. My wife sentences usually star with, “We… (must, need to, will,) do….” but what she really means is, the so familiarly all around “Honey do” . Exactly! Married life seems to be the same the world over. Well done! You know I’m a recovering remodeling contractor, and I intimately know the nature of this task. My hat is off to you. Only those who have went down this road can truly appreciate what is involved. My wife and I had the same debate when we remodeled the kitchen. In the end she agreed that having extra cabinet space trumped the dishwasher, though a little part of me now wishes that we put one in. Nothing like “old work installations”. The bane of every electrician and carpenter. The cabinet space is better than twice that of the old house, so it was not a factor. I did get lucky in that there was a switched outlet under the sink for a garbage disposal. I eliminated the switch and made it a live outlet. Then installed a sink top mounted air switch for activating the garbage disposal. I’m willing to bet that your next kitchen “honey-do” will be to install under cabinet-lighting to light up that counter top. Yep. Its on the ever expanding list. Three trips to the Big Box store – isn’t that the official definition of a project. LOL…its also a very good beginning to a nervous breakdown. Thanks for sharing Greg. Reminds me of my own situation when I moved into this house a couple of years ago. Originally built in 68 by the first owner (came with a copy of the blueprints) and not much had changed. 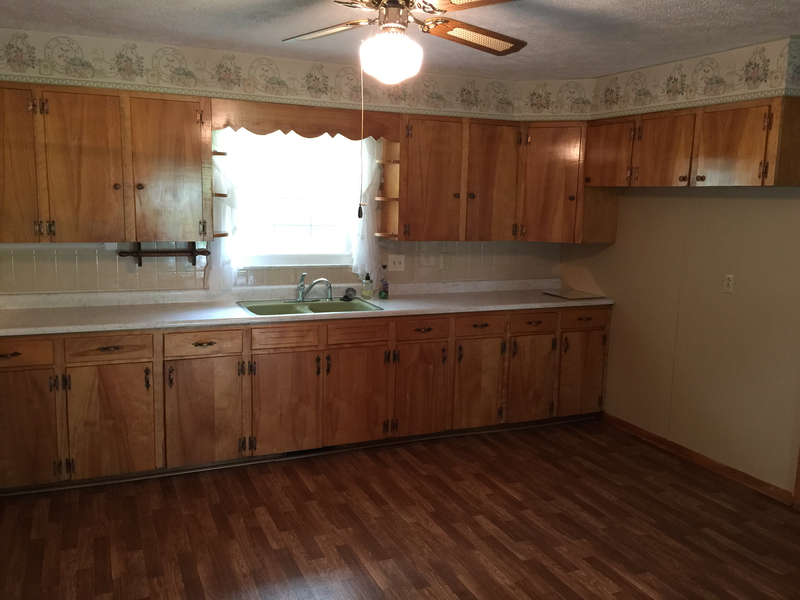 It has a dishwasher, but the cabinets are not nearly as nice as yours. I keep saying that I’m going to redo them but it looked like a lot of work. Your story makes me want to put it off even longer. These cabinets are in really good shape. Which is what made it so difficult to cut into them. I would have hated to make a mess of it.